Tonight’s dinner couldn’t be more simple. Split the squash in half and scrape out the seeds. Season the spaghetti squash with olive oil, salt, and pepper. Place the flesh side of the squash down and roast it for 40 minutes until fully cooked. Remove from the oven and let it rest until it’s cool enough to handle. Meanwhile, heat the sauce in a large saute pan with the chopped chicken. When the squash is cool enough to handle, using a spoon or fork, scrape the strands of spaghetti from the inside of the skin of the squash. 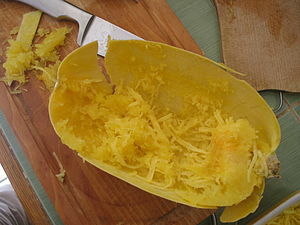 Optional – Toss the spaghetti squash in the a separate pan to cook off a little moisture. Next, move the spaghetti in with the hot marinara for just long enough to become a homogenized dish and not overcook. « To Everything Turn, Turn, Turn.